What Are They Driving Past? People will drive past three gigs to see Bruce Springsteen or the Foo Fighters. They will drive past three pizza shops to get to the one that cares about their customers and adds extra olives. They will drive their kids past three schools to get to the one that they believe is able to deliver a better level of education to their kids. They will walk past every coffee shop until they find the barista who makes their skinny flat white just the way they like it. They will click out of multiple websites until they find what they are looking for. They will ignore every street busker until they find one that engages and intrigues them. So today I have two questions for you. Are they driving past you to get to someone else? 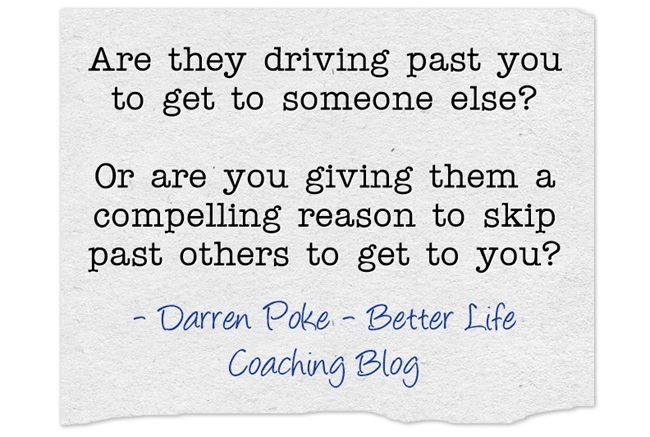 Or are you giving them a compelling reason to skip past others to get to you?